The UK tour of Ballet British Columbia that Dance Consortium has organized coincides with a change of government in Canada where the current liberal party under Justin Trudeau has filled up the cultural sector coffers the previous conservative party had spent years diminishing. Thus a medium-sized company from the West coast of Canada has been able to add to the country’s cultural profile in the UK and from the program Ballet BC offered at Sadler’s Wells it looks decidedly healthy. 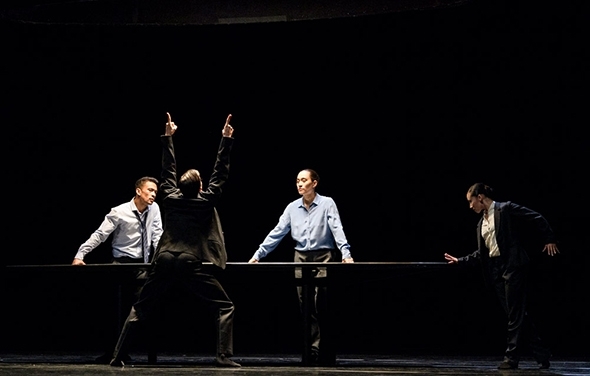 Artistic Director Emily Molnar’s opening choreography for this triple bill, 16+ a room, reminds us of the connection she has had with William Forsythe at Ballett Frankfurt although she has made the work very much in the image of her company. Only two of the current dancers remain from before Molnar became artistic director in 2009, so this is a group she has developed through exposing them to a rich gamut of commissioned works, choreographic methods and styles. It is a finely honed company that puts technical strength at the service of an engaging and generous choreographic language. From the beginning of 16+ a room (2013) there is a sense of an intellectual approach to the physical language, as if the dancers are working out amongst themselves the problem Molnar has set them. 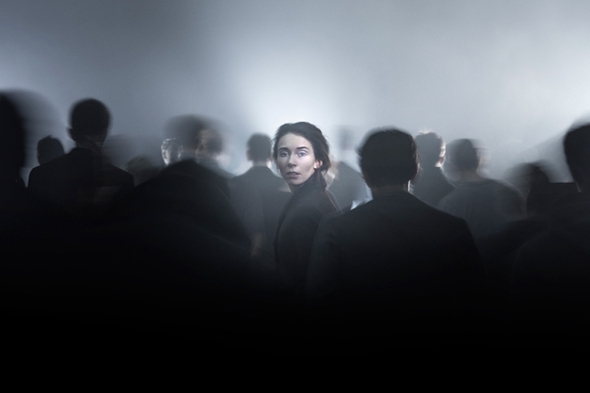 At the same time the problem she has set — what would happen if you put 16 people in a room and started tipping it — creates its own dynamic of sliding, balancing, suspending and tilting that she wraps in a vocabulary of muscular classicism. Jordan Tuinman’s lighting provides a sense of both luminous intensity and architectural shift while Kate Burrows’ costumes give freedom to the contained force and articulate extension of the dancers. The energy that tips the room comes from the declamatory electronic score of Dirk Haubrich, providing a high-voltage current through its three sections to bind together the choreography, visual form and aural environment of 16+ a room into a single organic entity. From Haubrich to Brahms is more of a musical step than it is to move from the style of Molnar to that of Crystal Pite. Each choreographer acknowledges a debt to Forsythe, and in Solo Echo (2012) Pite interpolates her vocabulary in the calm of Brahms’ chamber music (the Allegro non troppo from his Cello sonata in E minor and the Adagio affetusoso from his Cello sonata in F major). She quotes a poem by Mark Strand, Lines for Winter, in the program note, but Solo Echo is a poem in itself written on the bodies of the seven dancers and suggested in Jay Gower Taylor’s setting of falling snow. Between the exquisite opening solo of Brandon Alley and the ineffable sigh of his slumped body abandoned in the snow at the end is ‘a human journey from adolescence to adulthood’ that breathes with the emotional intricacy of the music. This is pre-Polaris Pite where the hive mentality has not yet coalesced; the sense of community is suggested rather through a constant tide of individual comings and goings, one motion inspiring another, not unlike the way the cello and piano weave their respective melodies yet maintain their respective voices. The unity of this intensely musical work is further enhanced by Pite and Joke Visser’s spare costumes of dark, pinstriped waistcoats and trousers while Tom Visser’s evocative lighting subtly indicates the shifting focus of our attention. If 16+ a room is extrovert and energetic, Solo Echo turns the dancers on themselves in a state of poignant reflection. After the second intermission, Sharon Eyal and Gai Behar’s Bill (2010), originally created for Batsheva Dance Company with a score by Ori Lichtik, promises to further extend the scope of Ballet BC’s achievement. Unitards concentrate our attention on the structure of the body, its lines, shapes and gestures in four male solos that are respectively sensually outrageous, energetically comic, fluidly articulate, and stoically introspective. But the fifth, female solo begins to de-emphasise the individual to pave the way for the communal — a duality that pervades Israeli choreography. Expanding our focus to take in the entire stage at once, the nature of the visual game is searching the shifting unity of the 18 undulating, gesticulating dancers for subtle changes in rhythm and shape that Omer Sheizaf’s tonal lighting both emulates and encourages. Eyal and Behar extract sufficient differentiation within the group, but after the assertive individuality of the first two works Bill feels in its latter construction disconcertingly insubstantial. It is perhaps a case of the work’s formal integration into the company’s West coast ethos lacking the vital context of its social and cultural origins. This is a program of repertoire works by former Royal Ballet dancers, David Dawson and Christopher Wheeldon, wrapped around a new commission by Crystal Pite, the first female choreographer to perform her work on the main stage in a long, long, time. Despite this landmark achievement, Pite is not a classical choreographer, nor are her works in the classical idiom. Borrowing a leaf from Tamara Rojo’s astute book, the Royal Ballet has brought in a lauded contemporary name on a contemporary theme at an appropriate moment. It is also borrowing from the book of Sadler’s Wells associate artists. Much as I love Pite’s work, Flight Pattern blends uneasily with both the accompanying repertoire and the surroundings. It’s a beautifully fraught work (beautiful and fraught) about the fate of migrants, not a subject that lends itself naturally to the velvet and gilded glamour of the Royal Opera House. It’s an oddly imbalanced program, too, because Flight Pattern is not a natural closer, and neither Dawson’s nor Wheeldon’s work prepares for it in any way; it comes out of nowhere. It is nevertheless a sublime conception, both scenically and choreographically, for a mass of 36 dancers with the suggestion of a lead migrant couple (an incongruous notion) of Kristen McNally and Marcelino Sambé. Anyone who saw Pite’s monumental Polaris on the Sadler’s Wells stage for the See The Music Hear The Dance program just over two years ago will remember her powerful massed forms of 64 dancers responding to Thomas Adès’ orchestral storm of the same name. Flight Pattern is more poetic and less menacing, influenced by the eerie refinement of the first movement of Henryk Górecki’s Third Symphony, but its subject is harrowing. The work visualises the endless lines of stooped humanity on a desperate trek to an unknown future but Jay Gower Taylor’s set, Thomas Visser’s lighting and Nancy Bryant’s costumes bestow epic proportions on the entire journey. The movements of the dancers are muted and repressed throughout the work, hemmed in by heavy overcoats and by the giant partitions of the set that close inexorably on them until only a gently rocking McNally and a seething Sambé remain isolated. It is a moment that almost spits with rage but Sambé at this crucial point allows his pyrotechnical wizardry to infiltrate his character, dissipating Pite’s entire psychological build-up. There’s plenty of legitimate technical display on the rest of the program, however, and the men get a thorough workout in Dawson’s first work for the Royal Ballet, The Human Seasons, to a commissioned score by Greg Haines. You know you’re at the Royal Ballet with this level of technical skill, though the loud landings (and there are many of them) of the men in particular exhibit some weakness in execution. The women are on display too, especially when upright; they are less so when being dragged unceremoniously along the ground. Seeing The Human Seasons (2013) side by side with Wheeldon’s After The Rain (2005) one can’t help seeing similarities; both are in the neo-classical style with stripped down costumes, and there are one or two quotes by Dawson of Wheeldon’s lifts and slides. Where the two works differ is in the use of space as part of choreographic form. For all its intense movement, its entrances and exits, and its asymmetrical groupings, The Human Seasons, unlike Keats’ sonnet that inspired it, is constantly crying out for some kind of form to hold them all together. This is amplified by a lackadaisical deportment in the men in between partnering duties or bravura steps; they just amble over to the next sequence, killing the dynamics. Haines’ score can’t hold the work together either, so with all these holes Dawson’s form fails to gel, leaking out in all directions over the course of the work’s 35 minutes. Scored for three couples, the first section of After The Rain is set to the first (Ludus) movement of Arvo Pärt’s Tabula Rasa; as soon as it begins, Wheeldon’s spatial stagecraft is apparent. The form is held in place by the harmony of the music allied with the harmony of the choreography, pumpkin rolls and all. The second movement, to Pärt’s Spiegel im Spiegel, is joined to the first but not closely related. It is often performed as a separate duet and its renown makes it appear as the feature film we’ve been waiting for. Marianela Nuñez and Thiago Soares make it a powerful meditation on the beauty of strength and the strength of beauty, where each gesture is thought through and flows seamlessly to its natural resolution. But while the consummate elegance of this movement is framed on one side, the absence of a final, contrasting movement leaves it floating in splendid isolation; it should either be set free for good or the frame completed.